Nissan Chief Operating Officer Toshiyuki Shiga signs the first Lada Largus leaving a new production line in Togliatti. Watching are AVTOVAZ President Igor Komarov (left), Renault Chief Operating Officer Carlos Tavares (center) and Russian Prime Minister Vladimir Putin. PARIS/MOSCOW -- Renault-Nissan and their Russia partner AvtoVAZ opened a new production line at the Russian automaker's factory in Togliatti. The line has an annual capacity of 350,000 units and will build vehicles for the three brands, Renault said. 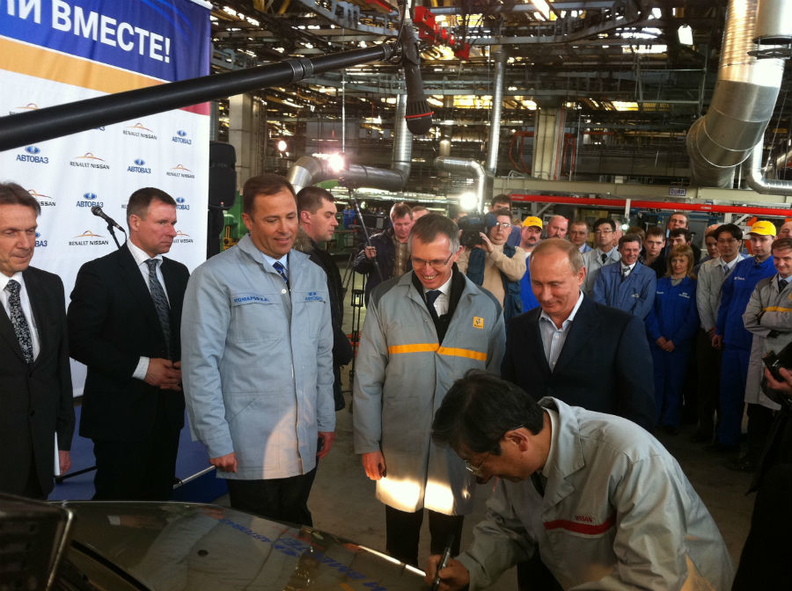 The line is the sixth at Togliatti, the world's biggest car plant, which is 1,000 km southeast of Moscow. Renault sees big opportunities in Russia because car ownership is low at 230 vehicles per 1,000 people, less than half the number than in France, and Russians strive to own a new car as a symbol of social success. The automaker hopes to complete its purchase of a majority stake in AvtoVAZ at the end of the month after buying a 25 percent share in the company for $1 billion in 2008. AvtoVAZ CEO Igor Komarov said his company will seek to borrow as much as 60 billion rubles ($2 billion) by 2015 for a big product overhaul to compete against international brands with help from Renault and Nissan. "This is the first time in many years, if not in decades, that AvtoVAZ is launching new projects on such a scale," he told Bloomberg. The Togliatti plant, which was built in the late 1960s with the assistance of Fiat, will more than double output from last year to 1.2 million cars by 2017, Komarov said. Renault-Nissan CEO Carlos Ghosn said the automakers will benefit as Russia increasingly becomes Europe's economic engine of growth. "Our collaboration is deepening every day and increasing economies of scale across the alliance," Ghosn said in a statement issued on Friday after a Job One opening ceremony for the new line. Russia will overtake Germany as Europe's biggest auto market in 2015 with annual vehicle sales of 3.4 million, according to consulting firm Ernst & Young. The Moscow-based Association of European Business (AEB) forecasts sales at 2.8 million this year. The first car off the new line was the Lada Largus, a rebadged version of the Dacia Logan MCV seven-seat station wagon. Renault invested half of the 400 million euros cost of AvtoVAZ's new line, while AvtoVAZ and Russian Technologies each provided a quarter. By year-end, AvtoVAZ will build 27,000 Largus vehicles and produce a Nissan model, with two Renault models planned for 2013, Komarov said. Five separate models will be produced on the line for the three brands. In the first three months of this year, Lada was Russia's biggest brand by volume despite its unit sales declining 15 percent to 109,388, according to the AEB. The second best-selling brand was Nissan, whose sales increased 52 percent to 42,117. Renault sales rose 27 percent to 39,303, placing the brand at No. 5 behind Hyundai at No. 3 and Kia at No 4. Renault-Nissan and AvtoVAZ sold 878,990 cars in Russia last year, including 578,387 Ladas. With a market share of nearly 33 percent, Russia is the third-largest market for Renault-Nissan and AvtoVAZ after China and the United States. AvtoVAZ aims to hold 25 percent of the market in five years, or 40 percent together with Renault and Nissan. Renault-Nissan may gain control of the Togliatti plant within two years, with the alliance paying in stages as goals are met, Sergey Skvortsov, managing director of Troika Dialog, which has 21 percent of AvtoVAZ that it plans to sell, said in an interview in February. At the end of last year, the factory started making a budget car, the Lada Granta, which is now on sale, to replace its biggest-selling brands, the Classica series and the Samara, next year. In 2009, the state gave AvtoVAZ a 75 billion-ruble bailout loan to avoid social unrest in Togiatti as the company cut its workforce from 102,000 to 66,000 through accelerated retirement and spinning off subsidiaries. The city depends on the factory as its principal employer. AvtoVAZ will probably generate a profit for this year following a loss in the first half, after the government phased out a rebate program, which had encouraged purchases of new domestically made cars to replace old models, Komarov said.